I cook such a wide variety of dishes and flavors from a seemingly crazy selection of recipes, that as much as you’d think I’d be satisfied with regard to food — I’m not. Good thing I’m the cook, right? Otherwise, that would sound truly ungrateful. It’s difficult to explain, but at times like this, I need something to eat that really stands out: a dish whose flavors come together perfectly, and no matter how many times I’ve had it before, I know it will be perfect. That I will never need to tweak the recipe — although I have — because it’s just right the way it’s written. AND…it’s healthy! So that means I can submit it to all the lovely foodies at Equal Opportunity Kitchen and their Tried, Tested and True…Take Two event which is focused on not only good, healthy eating, but to building much needed awareness of the important cause of organ donation. Healthy food, healthy organs, right? Although I’ve mentioned Michael Chiarello’s recipes in past posts, I haven’t shared this one in particular. That’s odd because in my wild world of cooking, this reigns as one of the few recipes I’ve made again and again. “Swordfish with Mediterranean Tomato Sauce and Linguini” is one of many outstanding recipes in his cookbook, Flavored Oils: 50 Recipes for Cooking with Infused Oils. I’ve tried over half the recipes in this book over the years, but this recipe is the best. Yes, the flavors of the “tomato sauce” are my favorite, and yes, the pretty packets of fish and vegetables with pasta are something that can be special for a few friends who will think you’ve been slaving over a hot stove all day, or just the right touch to a special occasion dinner. But my favorite aspect of this dish is that it takes almost no time to prepare from start to finish, and gives the impression that you’ve really put some time and expertise into it. Plus, the packets make controlled portions, so going back for seconds isn’t an option. I’ve never quite gotten the hang of folding the parchment exactly the way the directions describe, but it’s most likely from my lack of patience. But if you’re like me, wrap these bundles of deliciousness you own way. Just make sure you try them. Put tomatoes in a large bowl & season with salt & pepper. 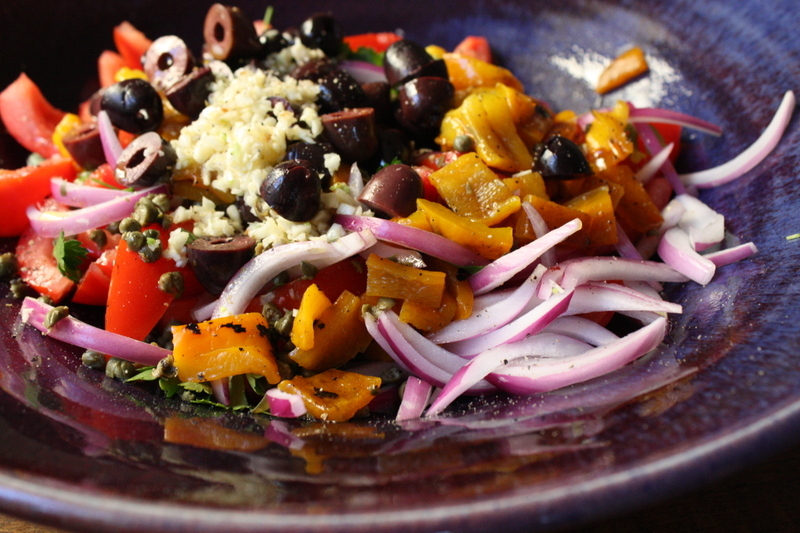 Add the oregano, parsley, garlic, onion, capers, peppers, olives, lemon juice, pepper oil, and 4 T olive oil. Toss lightly and set aside at room temp for about an hour, allowing flavors to mix, and juices to accumulate. Preheat oven to 450 degrees F. Cook pasta until al dente, drain and toss with 2 T extra virgin olive oil, then set aside. Cut 4 large pieces of parchment, at least 12″ long. Spoon a half cup of pasta on the center of each piece, top with a spoon of the tomato mixture, then place a piece of fish on top of that. Finish by spooning more of the tomato “sauce” over the fish. 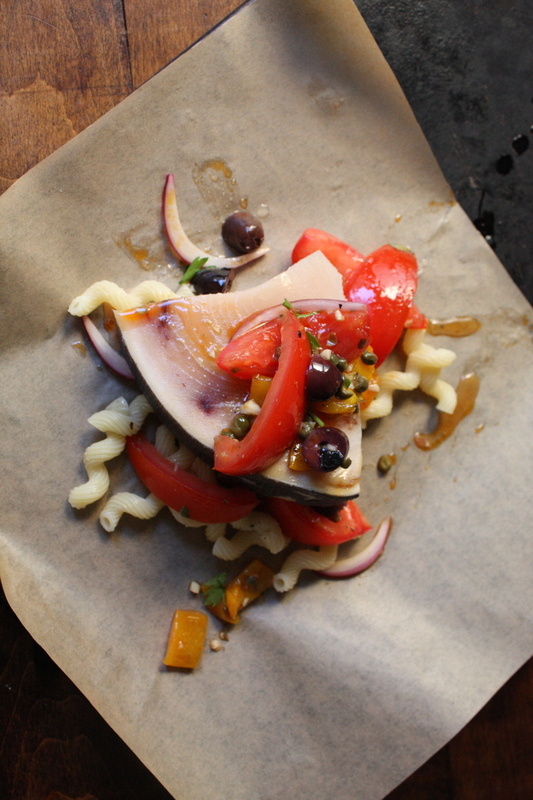 Bring the edges of parchment up over each piece of fish, folding and creasing as you might a lunch bag. You can also “scrunch and twist” if you prefer. The idea is to keep all the sauce in each package. 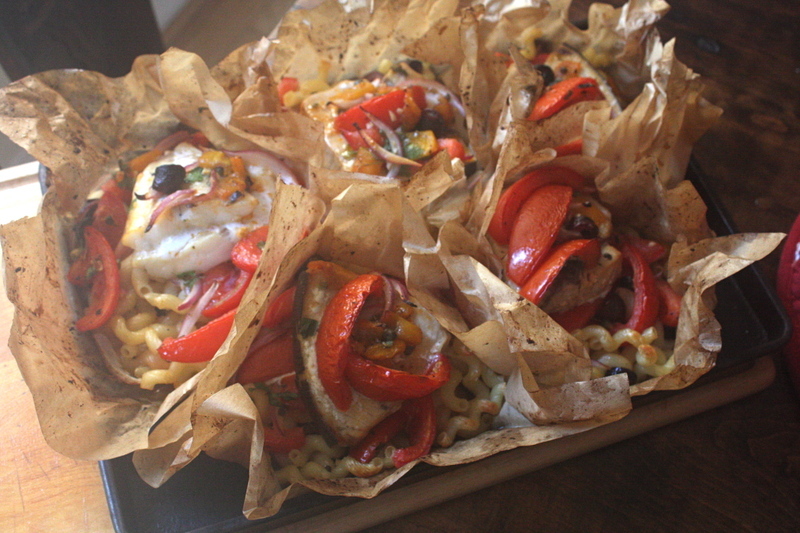 Place the packages of fish on a baking pan and bake for 12-15 minutes. Depending on how well sealed the packages are, they may puff up, and brown. Place each package onto a dinner plate to serve, allowing diners to open their own. Although I’ve made this dish each time by experimenting with traditional folds for the parchment, this time, I left them all open, drawing the edges up and scrunching them so they’d not fall flat during the baking time. A few of the piece of pasta did brown and get a bit crunchy, but it wasn’t a big deal. About the pepper oil…Consorzio is the absolute best, but I have tried others (Trader Joe’s sells it) if you can’t find it in your area. You can also add a bit of chili oil instead if you don’t mind some spiciness, but not the whole 2 tablespoons. Of course you can purchase roasted peppers, but it’s so easy to make your own by cooking them right over your gas stove, or under the broiler until they’re black. Then cover them with a dish towel for at least 15 minutes before you peel off the black, cut, core, and seed them. Make sure you do not rinse them with water or you’ll lose all that lovely flavor you created with the roasting. 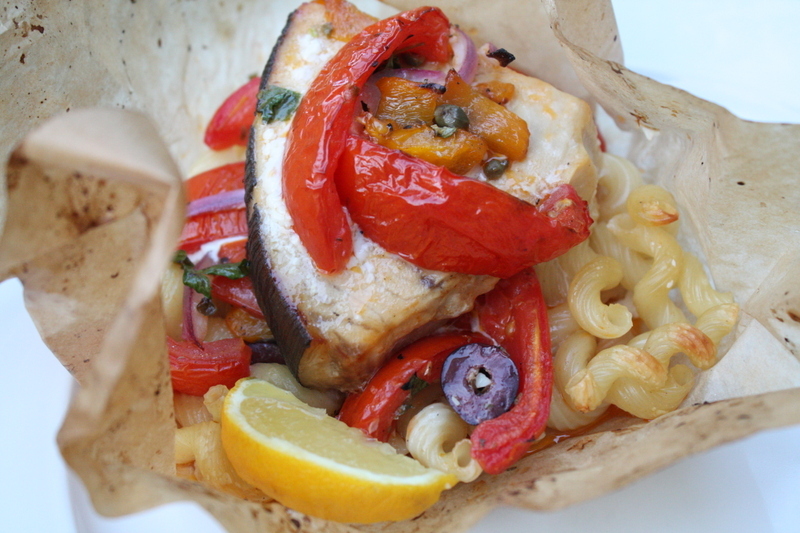 This recipe works with other types of fish, too: sea bass, halibut, cod, snapper…They’re all delicious. The tomato mixture is one of the best around and it’s great for bruschetta or as a pasta sauce without the fish. It’s really tasty!